Hamptons Lifestyle - City Fringe! Location Location Location - clichéd yes, but in this case very fitting. 61 Hamptons Road screams of opportunity with its unique location sited on the fringe of the Prebbleton village, strolling distance to the bus stop, while offering seclusion and privacy in its setting at the end of the private drive. 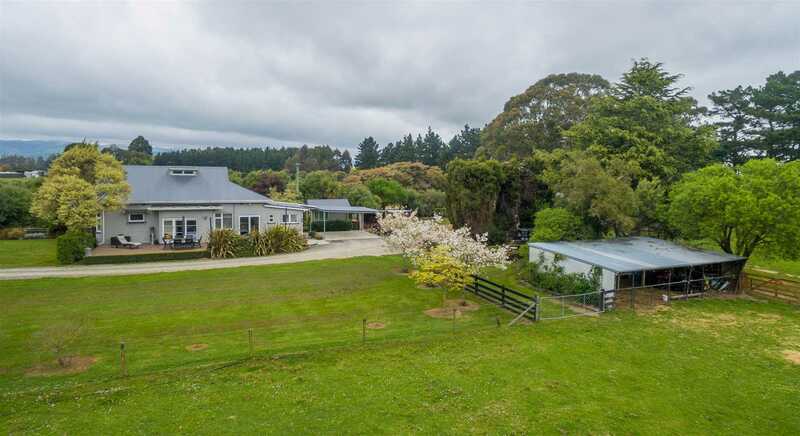 A well laid out 4-hectare property with mature trees, various out buildings including what is likely to create man cave/she shed envy of all your friends. Extras on the property include, cattle yards, hay barn, storage shed, sleepout and spa. The homestead is a gorgeous two storey character villa that has been well maintained with modernization of the roof, insulation, wiring, plumbing and a new kitchen. The kitchen offers stone bench top, large 90cm freestanding oven with gas hobs, good storage and doors opening out onto the north facing expansive decking providing excellent opportunities for outdoor entertainment and enjoyment as you watch the lambs play in the paddocks. Living spaces are generous with open plan dining and living area warmed by inbuilt fire and heat pump and decorated tastefully in neutral colours. Downstairs are three double bedrooms, one of which access the decked area the other two are large with inbuilt cabinetry and beautiful bay windows. The upper level accommodates the fourth double bedroom, separate toilet and bathroom. Make your move as properties such as this in this location do not come to the market often and my realistic owners are saying SELL so they can confirm their next move. "Please be aware that this information has been supplied by the vendor and/or sourced from: Property Guru, Property Smarts, Land Information NZ, Local Councils, ECAN, CERA and other organisations. Four Seasons Realty 2017 Ltd is merely passing over this information as supplied to us. We cannot guarantee its accuracy or reliability."